Taco Bell is the best in the world at maniacally throwing tasty things together into a whole that's even more delicious than the sum of its parts. Consider cheesiness and crunchiness, Doritos and Locos, or baja and blast. Nothing, however, proves the chain’s mastery of this concept like its recent decision to continue coupling fast-food combos with the ultimate food pairing: booze. The fried chicken taco shell creator is opening 300 to 350 new locations in the next five years, mostly in urban areas, with 50 in New York alone, plus spots in several West Coast cities and heartland locations like Detroit, Pittsburgh, and Nashville, according to a report by Eater. The majority of these new outposts will be Cantina locations with localized ambiance, tastefully exposed Edison light bulbs, and most importantly, bountiful booze. Menus will include beer, wine, sangria, and boozy slushies called Twisted Freezes (yes, there's a Baja Blast version) made with vodka, rum, and tequila. In the past, T-Bell has mostly catered to suburbia’s 2am Crunchwrap cravings with its more 6,000 US locations, and this has meant an emphasis on drive-thrus, the source of between 55% and 70% of the average store’s revenue. The new batch of locations will mostly forgo the drive-thru and focus on a sit-down experience, emphasizing shareable food like nachos and chicken fingers and the aforementioned alcohol. In the last two years, the chain has found success with walk-ins that's comparable to drive-thru locations. 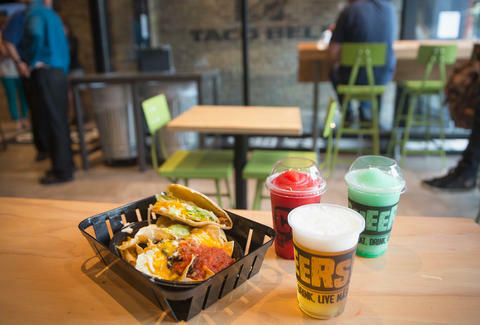 Taco Bell opened its first boozy Cantina in Chicago’s Wicker Park neighborhood in 2014, complete with drinks such as the aforementioned adult slushies and new “shareable” food items mini quesadilla nachos and chicken tenders that come served in nice baskets in lieu of the signature wrappers. The decidedly urban-style restaurant paved the way for similar locations in Cleveland, San Francisco, and Las Vegas (its giant flagship restaurant). But, boy oh boy, do we want it. James Chrisman is a Copy Editor at Thrillist who is also a combination of baja and blast. Send news tips to news@thrillist.com and follow him on Twitter @james_chrisman2.